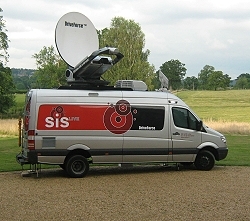 SIS LIVE satellite uplink trucks - UK. Milton Keynes, May 2015: Leading connectivity provider SIS LIVE, was relied upon by the UK’s main news broadcasters to provide uplink facilities for their general election coverage, on a night when speed, reliability and clarity were vital to ensure comprehensive reporting. SIS LIVE provided 70 satellite uplink vehicles to the main UK broadcasters, as they covered the voting and results in one of the most unpredictable elections in memory. Uplink vehicles and SIS LIVE crew were deployed throughout England, Scotland and Wales, giving the broadcasters unprecedented coverage of the main electoral battlegrounds during a night of high drama watched by millions of viewers. SIS LIVE’s clients, including the BBC, Sky News, ITV, ITN, and STV, took advantage of the organisation's unparalleled connectivity, to ensure their audiences missed none of the twists and turns unfolding under the election spotlight. Most services were delivered as part of long-running contracts to supply the broadcasters with live news coverage. The sheer number of key battlegrounds meant the broadcasters’ biggest challenge was reporting back from them all, with correspondents feeding back live input from a huge variety of locations, from rainswept hills and windy valleys to overcrowded, noisy count venues. Worldwide interest in the result meant overseas broadcasters, too, were vying for satellite space. But SIS LIVE’s permanently leased, dedicated satellite capacity, as well as its unrivalled uplink expertise and experienced crews with backup support, meant their clients’ live coverage was delivered without a hitch. SIS LIVE provided the UK broadcast industry with approximately 550 MHz of Ku and Ka band satellite capacity on 4 different satellites, some permanently contracted, with a significant amount supplied from the company’s large pool of in-house, ad-hoc capacity. Many of the uplinks also used SIS LIVE’s innovative, fully automated DriveForce uplink system. Jackie Faulkner, director of operations, Sky News, said: “The biggest challenge in covering a UK election is being able to deliver all the action and results as they happen – from all corners of the UK. Bevan Gibson, chief technology officer, ITN, said: “SIS LIVE’s teams once again worked closely with us, as a part of our operation on election night, to ensure live content was able to be inserted into national coverage throughout 24 hours of unmissable drama as the election unfolded.